Mary McDunn had a solid game at goalkeeper, despite the GFH loss Tuesday. We’re well into another week, which means the Prep Extra ran Tuesday. We’ve got a column from Daniel Mediate and a column from Jesse Geleynse, if you haven’t already read them. You should also check out Lee Vernoy’s debut in the Weekly Prep Chat. There was plenty of excitement at Siebel Soccer Park Tuesday as the C.M. 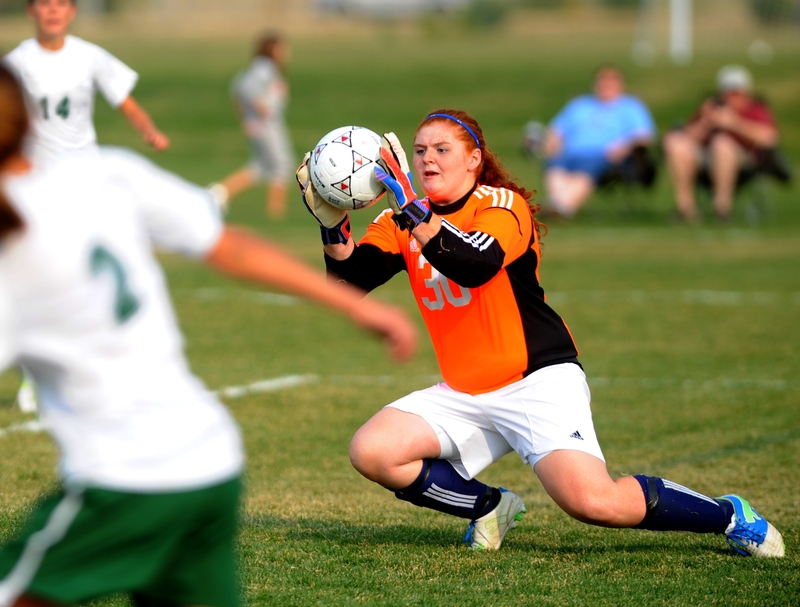 Russell High boys’ and girls’ soccer teams swept their Great Falls High counterparts. The Rustler girls, fueled by the Weber twins, collected a 3-1 victory over GFH, while the CMR boys downed GFH 2-0 for their first win over the Bison since 2010. McKenzie Weber, who is second in the Eastern AA with seven goals to Senior’s Gabi Heflin, converted a penalty kick, while twin sister Anna scored a goal in each half for the Rustlers. Still, head coach Rob Zimmerman was far from pleased afterward. CMR did leave a number of chances on the table and didn’t play with a ton of energy or emotion, as Zimmerman noted afterward. The GFH girls gave head coach Lindsay Smith reason for optimism as Callee Remsen knocked down a goal in the second half. The Bison secured a number of free kicks within range, but were unable to convert. It’s also worth noting that Lelani Barr is playing with a cast on her right hand. Smith said they weren’t yet sure of the exact nature of the injury. There was no lack of emotion in the boys’ game. Ryan Nommenson knocked down a beautiful shot from well beyond the 18-yard box for the 1-0 lead. Nick Downs, who missed the first crosstown game while on a recruiting trip, made it 2-0 in the second half as he collected a punt from keeper Taylor Koth and hit the upper V with a left-footer to complete the scoring. Both CMR and GFH volleyball teams are in action Thursday. CMR looks to collect its first win of the season with a nonconference contest with Class A Havre, while GFH plays host to two-time defending Class A state champion Lewistown. And it’s Wednesday, which means the high school football polls are out. Helena Capital moves to No. 1 after previously undefeated Bozeman lost at Glacier. CMR collected two first-place votes, while Butte and Helena High each garnered one. Billings Central is the unanimous pick atop Class A, while Manhattan picked up nine votes to lead Class B. Malta is ranked second in Class and received two first-place votes. Fairfield is No. 7, while Choteau cracks the poll at No. 10. Glasgow is also among those receiving votes. CJI held at No. 2 in the Class C poll, behind Fairview. Chinook is No. 6, while Great Falls Central just missed out on cracking the top 10. And in Six-Man action, Big Sandy is No. 3, Valier is No. 4 and Geraldine-Highwood is No. 6.
. Continue to check back often for updates.